Middle-aged salaryman? Packing a beer- and bar snacks-expanded waist? Well it’s time to quit moaning and belt up. 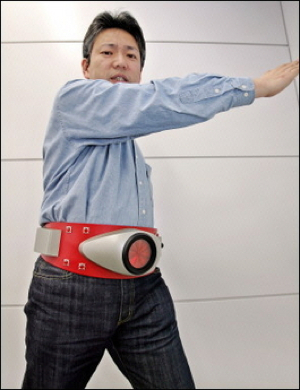 In a stroke of genius, Bandai has come out with an adult-sized version of the Kamen Rider action belt from the hit ‘70s action hero program, and Japanese office workers in the their 40s are snapping them up like there’s no tomorrow. This piece of high-tech garb, festooned with plastic and emblazoned with LEDs, sells for ¥30,000. So now, Tanaka-san, you too can be a superhero, and not just for one day.